Guillermo del Toro’s latest film is a hyper-gothic fantasy filled with ghosts, gory bloodshed and flouncy Victorian nightgowns. Mia Wasikowska takes on the lead role as Edith, a young heiress with a passion for writing ghost stories, rather than the romance novels her editor wants to read. Her fortune takes a turn for the macabre when she marries an English baronet (Tom Hiddleston) and is taken to their haunted castle in England. Wasikowska’s performance is steady and powerful, and she manages to exhibit a convincing range of emotions, despite spending most of the film wearing a voluminous nightdress that covers her up to the chin, with a head of Pre-Raphealite blonde hair that leaves only a small triangle of her face exposed. The film opens with a shot of Edith with blood smeared on her hands and face as she stands in the snow. A tear trickles down her cheek, and the audience know instantly that they are in for a heady ride of horror and gore. This film wears its heart on its sleeve, revelling in its dual aesthetics of theatrical gothic and fantastical bloodiness. It encapsulates a gruesome fantasy world that feels like the peak of Guillermo del Toro’s aesthetic career; this is Pan’s Labyrinth on steroids. Some of the effects are so extreme and stereotypical they are almost comical: long, shadowy fingers stretch down a hallway, door handles rattle and the ghost of a dead mother makes no attempt to soothe her child, warning her of the dangers of “crimson peak”. There is no doubt that del Toro is referencing almost every other horror movie ever made, both paying homage to them and also verging on parody. Despite two visitations from Edith’s dead mother, the film takes some time to warm up. In the scenes set in Boston, before Edith is plunged into the Gothic hell of Allerdale Hall, the acting is stilted and the contemporary behaviour of the characters jars with the historic setting. This is unassuaged by the falsely old-fashioned language; the director seems to think that authenticity can be achieved through the occasional “good sir”. It is only when Edith is taken to England that the film comes into its own and del Toro’s imaginative genius is given free rein. The horror is explicit and fully embodied in the skilful creation of ghostly figures. There’s no unexplained rustling of the curtains here; every ghost is characteristically gruesome, bloody and given a physical form. The sheer scale of gore and ghostly appearances makes the film a little overwhelming at times and distracts from the fear that is effectively evoked at other points. Nevertheless, it all adds up to a huge, sumptuous tableau of gothic horror, which constitutes del Toro’s masterstroke in this genre. 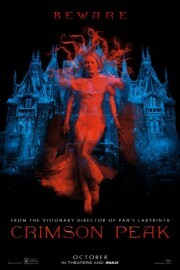 Crimson Peak is released nationwide on 16th October 2015.